It appears the US and UK have more than a cultural attachment and heritage! 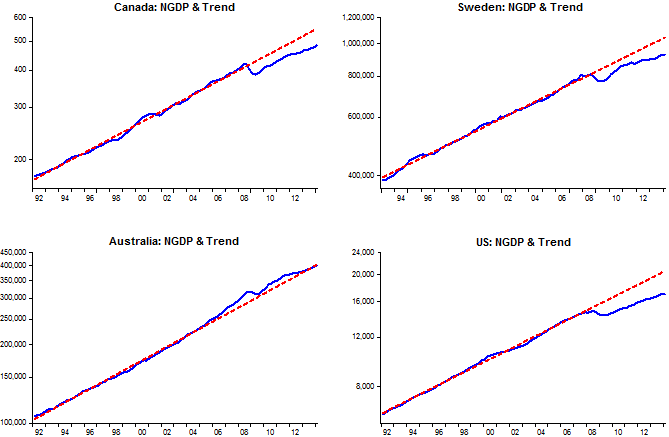 Take a look at the evolution of their normalized NGDP and RGDP. The trends are essentially the same for both countries and it is hard to distinguish between them. The next chart zooms in on the last 10 years for NGDP. Both countries appear to have very similar monetary policies, with both “suffering” a “Great Depression” of similar significance and both experiencing a very weak recovery! 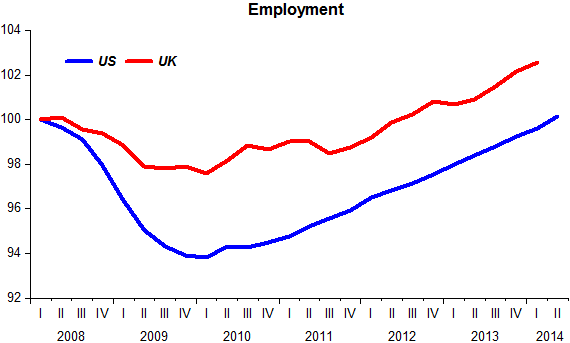 The question that has baffled commentators: Why is the UK´s labor market so much more exuberant? The chart shows the behavior of employment since their pre-crisis peak. 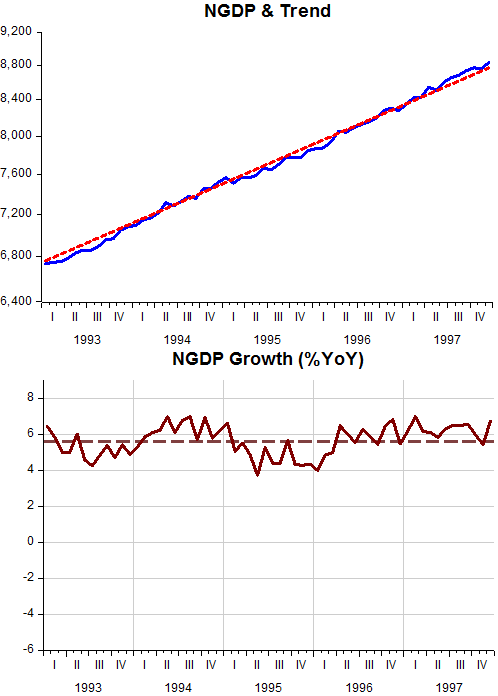 While the US experienced largely a negative demand shock (a shift to the left of the AD curve – a fall in the rate of growth of NGDP below the trend level growth rate), the UK experienced a mixture of negative AD and AS shocks. 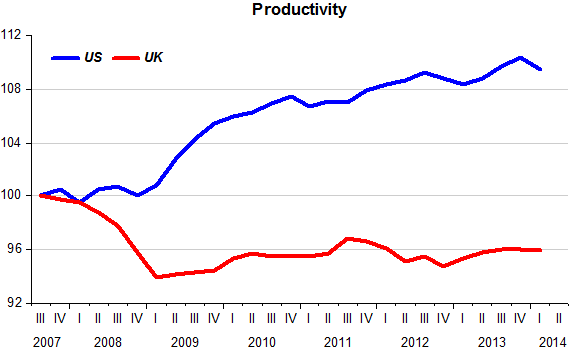 The negative AS shock in the UK is observed in the chart below which illustrates the behavior of productivity in the two countries. The dynamic AS-AD model predicts that if you have a negative AS shock on top of your AD shock, real output growth will fall by more AND inflation by less than if you experience only an AD shock. 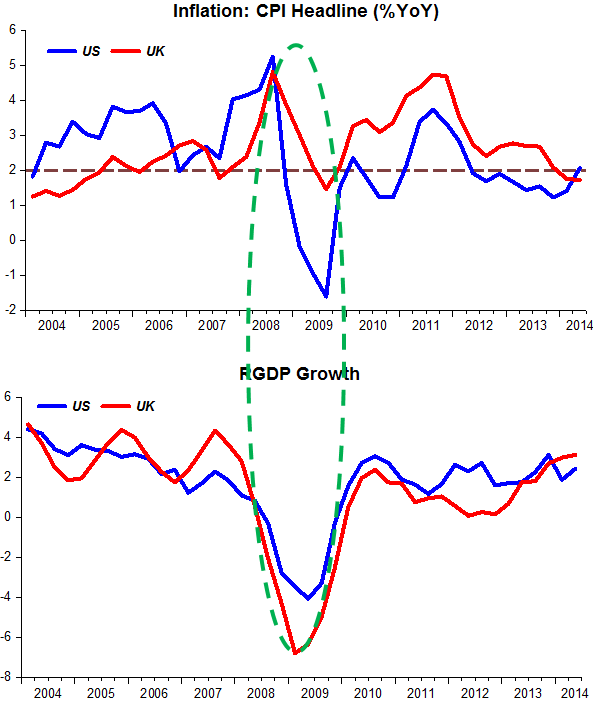 That pattern is clear in the charts showing real growth and inflation in the US and UK. If you use the MM model to compare countries, you sort of implicitly assume similar labor markets. Then the country with the faster NGDP growth will have more job creation. But of course labor markets are not all equal, and some of the inter-country differences in employment will be due to wages, and only a portion will be due to NGDP growth differentials. 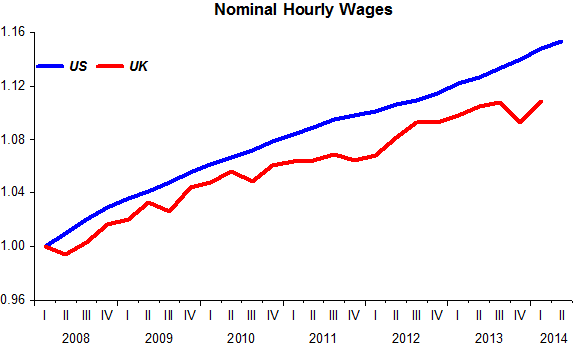 The chart indicates that wages in the US have increased by significantly more than in the UK, Given the higher rate of inflation in the UK until recently, real wages have differed by even more. Since the NGDP path of both countries has been very similar, the differing labor market behavior must be mostly due to wage behavior in the two countries. 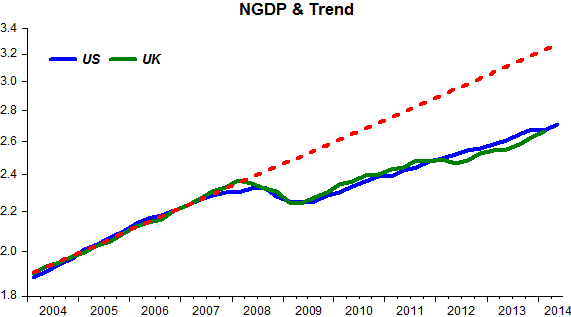 PS: The depressed state of productivity in the UK is reflected in the worse post crisis relative performance of RGDP. Structural reforms are needed! Do Aussie Central Bakers Have A “Good Enough” Solution? The Reserve Bank of Australia (RBA) shoots for an “inflation band” of between 2 percent and 3 percent, and the Aussie economy (as recently illustrated here by Marcus Nunes) has been among the best-performing following the 2008 Great Recession. Could it be that simple? 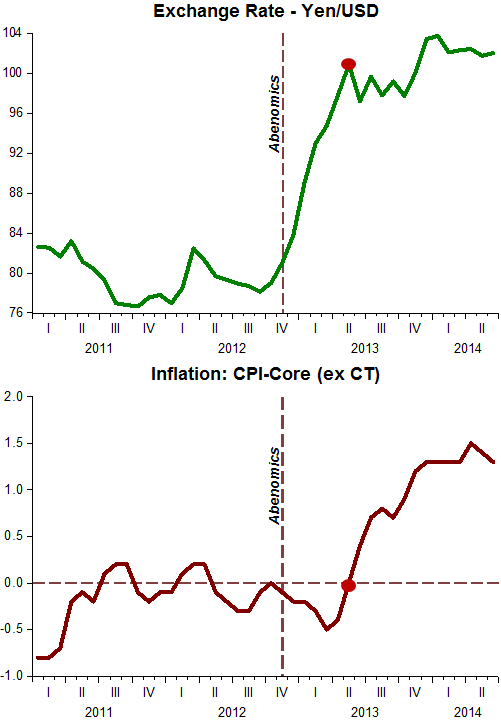 Should central banks merely shoot for a somewhat flexible and slightly higher inflation target? Worth noting is the People’s Bank of China has overseen much prosperity with a 4 percent inflation target. I have grown increasingly concerned about the risks posed by current monetary policy. First, we are experiencing financial excess that is of our own making. There is a lot of talk about “macroprudential supervision” as a way to prevent financial excess from creating financial instability. But macroprudential supervision is something of a Maginot Line: It can be circumvented. Relying upon it to prevent financial instability provides an artificial sense of confidence. Second, I believe we are at risk of doing what the Fed has too often done: overstaying our welcome by staying too loose, too long. We did a good job in staving off the deflationary and depression risks that were present in the aftermath of the 2007–09 financial crisis. But we now risk fighting the last war. Third, should we overstay our welcome, we risk(!) not only doing damage to the economy but also being viewed as politically pliant. In other words, he wants carte blanche to “mess up”! As the chart shows, he´s “miles away” from “destination” (and going the “wrong way”). In some cases the central bank cannot control inflation while in others it cannot promote it! The nationwide core consumer price index rose 1.3% from a year earlier in June, after adjustment for a recent sales-tax hike, below a 1.4% increase the previous month, according to government data released Friday. Inflation moderated in May and June due to falling energy prices and a stable yen, which has put the break on growth in import costs. But because the exchange rate is a “perfectly flexible” price it changes immediately, while inflation lags behind. This leads many to think it was the depreciation which “caused” the rise in inflation, when in fact both are driven by the rise in inflation expectations brought about by the monetary expansion. The charts give a clear illustration. 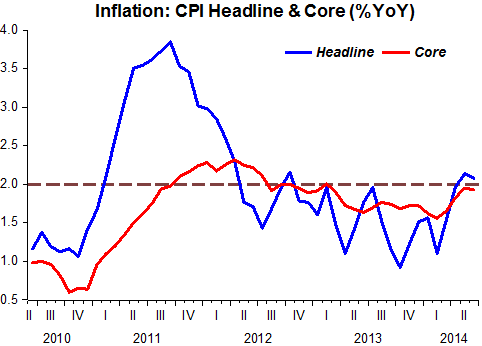 The inflation is that of the CPI-Core and is adjusted for the rise in the consumption tax in April of this year. Note that the yen begins to depreciate immediately following the introduction of Abenomics. Inflation takes a while to “take-off” and by the time it does, the yen has already “stabilized”. Japan´s annual inflation rate was stable enough in June that it is unlikely to trigger a fresh round of monetary stimulus by the Bank of Japan. So, it´s up to you, Kuroda, to make it likely! As you can see in the chart below, over the past three decades the U.S current account has been in surplus only briefly in the first half of 1990. Since then, it has been continuously in deficit. How is it that the United States can keep borrowing without a collapse in the currency or a surge in borrowing costs? Is there some sort of limit? One possible answer is that because the world runs on U.S. dollars, everyone needs U.S. dollar-denominated securities. Countries use these both to transact and to insure themselves against foreigners’ suddenly deciding to withdraw assets – a capital flow reversal. These needs result in the “exorbitant privilege” that accrues to the United States as the issuer of the reserve currency. Overall, these simple computations lead us to conclude that the U.S. current account deficit can remain at 2% of GDP or more for some time to come without threatening the value of the dollar or triggering an externally driven surge in U.S. borrowing costs. Which made me wonder about what sort of “super exorbitant privilege” accrues to Australia which has run larger and more persistent current account deficits (a pattern that goes back all the way to the 19th century)? Its currency is also denominated “dollars”, although A$, not US$! Recently, as I cast list here, there has been a back and forth between Keynesians (Old & New) and Market Monetarists. First, the Fed adopts a NGDP level target. Doing so would better anchor nominal spending and income expectations and therefore minimize the chance of ever entering a liquidity-trap… [I]f the public believes the Fed will do whatever it takes to maintain a stable growth path for NGDP, then they would have no need to panic and hoard liquid assets in the first place when an adverse economic shock hits. Second, the Fed and Treasury sign an agreement that should a liquidity trap emerge anyhow [say due to central bank incompetence] and knock NGDP off its targeted path, they would then quickly work together to implement a helicopter drop. The Fed would provide the funding and the Treasury Department would provide the logistical support to deliver the funds to households. Once NGDP returned to its targeted path the helicopter drop would end and the Fed would implement policy using normal open market operations. If the public understood this plan, it would further stabilize NGDP expectations and make it unlikely a helicopter drop would ever be needed. 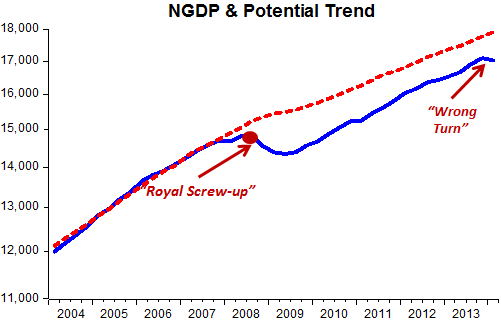 If I understood it correctly, outside the ZLB, monetary policy is “king” (so NGDP targeting is fine and good). But SWL says that “if the central bank thinks there is more than a 50% chance that they will hit the ZLB…”. But the beauty of NGDP level targeting is that, as DB argues, it would “make it unlikely a helicopter drop would ever be needed”. That´s because hitting the ZLB would just not happen. Australia, for example, who kept NGDP close to the target path all through the crisis, never came close to the ZLB! The Fed and Treasury could easily agree to that proposal because that would likely be the cheapest social insurance the government could provide, given that the likelihood of a “pay-out” would be microscopically small. Why? Because if the central bank allowed it to happen it would be a testament to its incompetence so they would work diligently not to let it come to pass! Maybe being an island off the beaten path helps clear-thinking! The Financial System Inquiry’s interim report recognised that the Reserve Bank and the Australian Prudential Regulatory Authority have considerable scope to manage risks to financial stability without greater reliance on so-called macro-prudential policies. It noted that the effectiveness of such measures is not well established and that there are practical difficulties in their implementation. The inquiry largely echoes the views of the Reserve Bank and other Australian regulators on this issue. IT, PLT & NGDP-LT: Is there a story? In the 1980s and even before, NGDPT was widely discussed, while there was no similar discussion about IT. But as it often happens, circumstances ended up “electing” inflation as the target of monetary policy. The “circumstance” in this case was the desire of the NZ Prime Minister to make government agencies more efficient. To that purpose he required everyone to define goals and targets that would allow objective evaluations. When it came to the Reserve Bank of New Zealand, the Governor put forward the idea of targeting inflation (at the rate set by Parliament). The idea spread like bush-fire and sequentially several countries adopted “IT”. At that time, early 1990s, Friedman had already convinced (most) of the world that inflation was a monetary phenomenon so there was no better choice than for the Central Bank to conduct monetary policy in such a way as to avoid inflation getting “out of hand”. Even an inflation prone country like Brazil had success with IT which was introduced in early 1999 concurrently with a massive (almost 100%) devaluation of the exchange rate (which had been, for the previous five years, the nominal anchor and responsible for the success of the Real Plan in ending hyperinflation). A period of low and stable inflation took over, even for many countries that never formally adopted the target. The US, for example, is one such case. Inflation targeting emerged in the early 1990s and soon became the dominant monetary-policy regime. It provided a much-needed nominal anchor that had been missing since the collapse of the Bretton Woods system. Its arrival coincided with a rise in macroeconomic stability for numerous countries, and this led many observers to conclude that it is the best way to do monetary policy. Some studies show, however, that inflation targeting got lucky. It is a monetary regime that has a hard time dealing with large supply shocks, and its arrival occurred during a period when they were small. Since this time, supply shocks have become larger, and inflation targeting has struggled to cope with them. Moreover, the recent crisis suggests it has also has a tough time dealing with large demand shocks, and it may even contribute to financial instability. Inflation targeting, therefore, is not a robust monetary-policy regime, and it needs to be replaced. In many (most?) cases, “IT” is coupled with a rule for the instrument; a central bank determined interest rate (the Fed Funds rate in the US, for example). Because of that quirk, monetary policy has become synonymous with interest rate policy. And if interest rates are very low, as at present, central bankers (and analysts) only talk about the “need” to “normalize” monetary policy, i.e. get interest rates up to more “normal” levels. The problem associated with low (or very low) policy rate has been discussed for at least 15 years in conferences and papers with titles such as “How to conduct monetary policy in a low inflation environment”, the idea being that if inflation is “low” (or “on target”), interest rates will also be “low”, so that if a shock comes along that requires interest rates to be lowered further, the ZLB will “prevent” monetary policy from being effective, that being the situation which is perceived by many today and why we hear arguments for an increase in the inflation target rate. Ironically, you also hear the same people saying monetary policy is “easy” (because interest rates are very low). They don´t connect with their stated view that interest rates are low because inflation is low, meaning that monetary policy has been “tight” (to bring inflation down to target). They should reread their Friedman! One problem with IT, in addition to those discussed by Beckworth is that it is “memoryless” with regards to the price level which is what matters most for economic decisions. For that reason we have also had frequent discussions about the benefits of the central bank adopting a price level target (PLT). See here for an example. And then there is NGDP-LT (LT=level target) which is the favorite target of market monetarists. Basically, instead of having inflation running at the target rate or the price level evolving at a constant level target rate, NGDP-LT will have the central bank controlling the aggregate nominal spending (NGDP) in the economy evolving along a level target rate. How to choose among them? You could (and people have) build models that will (hopefully) allow you to evaluate them. Another way is to do an empirical analysis where your “model” is history. 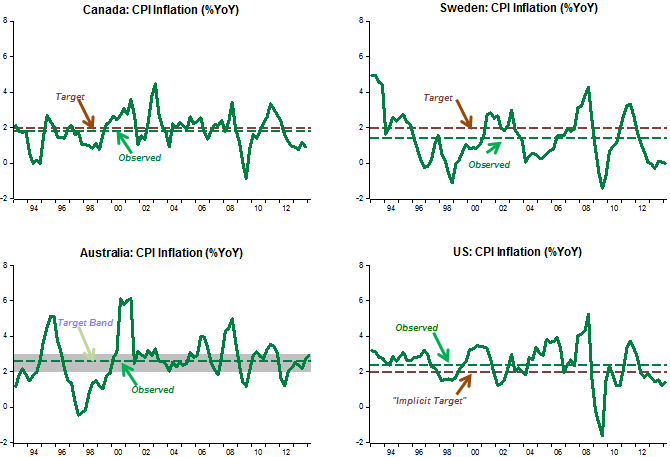 The charts show (for (1)) that, with the exception of Australia (which has a target band, not rate) they were either above “target” (US) or below “target” (Sweden and Canada (with Canada showing only a small miss)). 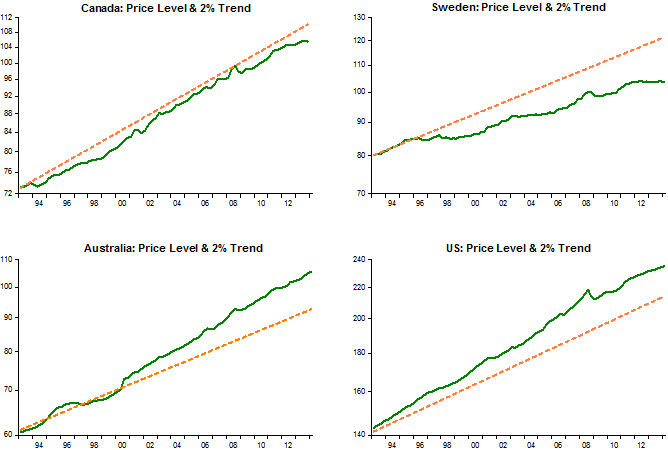 For (2), the charts show that with the exception of Canada whose price level has remained close to the target path (as inflation has remained close to target), the others show significant divergences from the price level target path, either positive as in the case of Australia and the US or negative as in the case of Sweden. It seems that (3) is a clears “winner”. In all cases, irrespective of inflation being a bit above or below target on average or the price level showing positive or negative divergence from the level path, NGDP remains close to the target path all the way up to the crisis. Interestingly, the country that suffered the least pain (in terms of real growth and unemployment) was Australia, not coincidently the only of the countries shown that did not allow aggregate nominal spending to diverge (especially in the downward direction) from the target path. While the other countries are trying all sorts of “potions” to try to get back “on their feet”, including dilly-dallying with additional terms in their mandate (like “financial stability” or, in the case of the US additionally enshrine the Taylor-Rule as “policeman” for the Fed´s actions), Australia is back on the original trend level path. Takeaway: The central bank that best takes care of maintaining NOMINAL (spending) stability does best. In determining monetary policy, the Bank has a duty to maintain price stability, full employment, and the economic prosperity and welfare of the Australian people. To achieve these statutory objectives, the Bank has an ‘inflation target’ and seeks to keep consumer price inflation in the economy to 2–3 per cent, on average, over the medium term. Controlling inflation preserves the value of money and encourages strong and sustainable growth in the economy over the longer term. But what they really provided was nominal stability! Even in Sweden, where 4 years ago the Riksbank decided there was “too much debt” and raised rates to “calm people down”. That, as we know, ended in grief and with the head honcho being outvoted (first time that happens) in the last policy committee meeting, when the policy rate was lowered by 50 basis points to 0.25%. Should the Riksbank have financial stability as an objective besides price stability? According to an op-ed by Carl B. Hamilton in Dagens Industri on July 17, the answer is yes. According to Hamilton, this is even a practice already established by the Riksdag (the Swedish parliament). The Riksbank Act needs to be amended, but only as a formality. But Hamilton forgets that the Riksbank has no effective policy instruments to affect financial stability, except in connection with the management of financial crises. He also forgets that the government with the support of seven parties in the Riksdag – including Folkpartiet (the Liberal Party) – has decided that the Riksbank will not receive any such instruments. Without the instruments, the Riksbank neither can nor should have financial stability as an objective. The fact is that Sweden has done a pretty bad job. 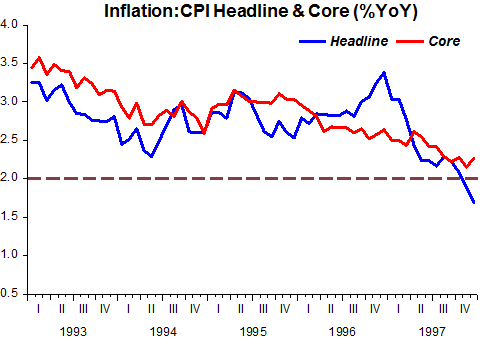 It´s mandate calls for 2% inflation, nevertheless, since 1994 inflation has averaged only 1.3% per year. And the average is the same including or excluding the post crisis (2008) years! Pre-crisis, in countries such as the US or Canada, among others, you couldn´t distinguish from the data if the central bank was targeting inflation, the price level or NGDP. All those were observationally equivalent. I´ve shown previously that the only “dog that barked” was NGDP level targeting. 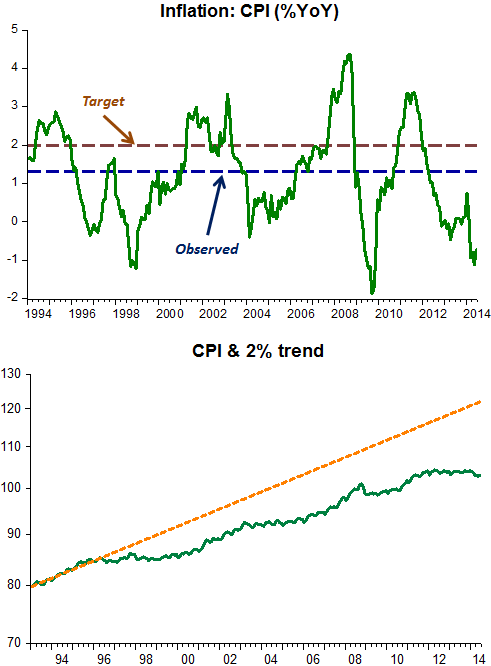 In Sweden, on the other hand, inflation was far below target on average and so was the price level (consistent with 2% inflation). The charts below illustrate. 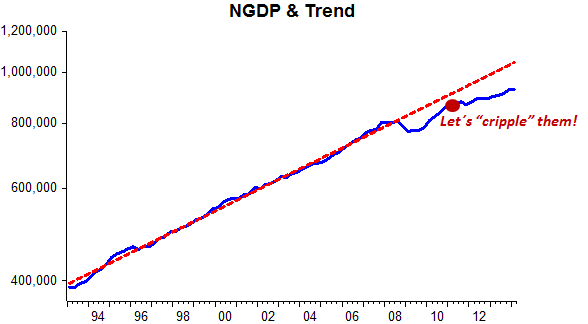 Nevertheless, completely unwittingly, NGDP remained close to a level trend until the crisis hit. 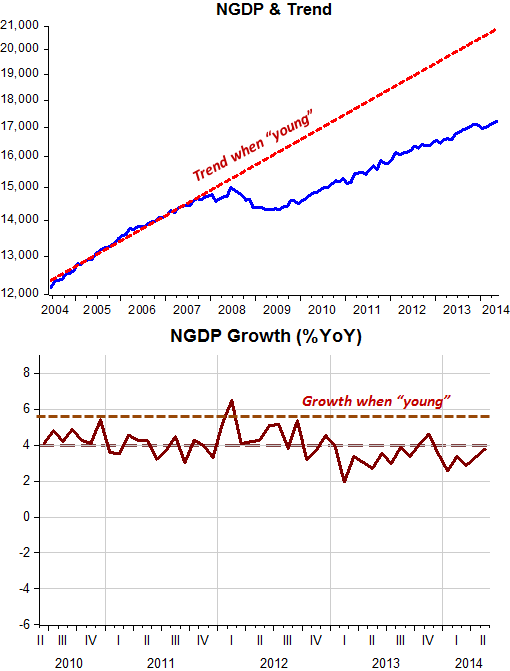 And despite inflation (on average) remaining below target, NGDP was climbing back to the previous trend rate. That is, until 2010 when the Riksbank decided it was time to restrain people´s (and house price) exuberance! So Sweden provides a good example (evidence?) that what really matters for the central bank is to provide NOMINAL stability. When it does so things work out, even if inflation (or the price level) remains below “target”.